Frustrated by the declining standards and continued defeats in Football at international level despite the financial might possessed by the Football Federation, Sports Minister Mahindananda Aluthgamage has personally devised a progressive new structure for the game in the country that is aimed at unearthing the hidden rural talent and fast tracking them into the national team. 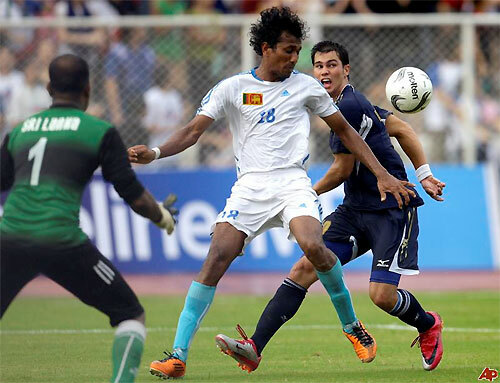 “Sri Lanka had a glorious past in football. We held a respectable position internationally and even the domestic game was very competitive. But it has gone down pathetically and today we are even losing to Maldives” Minister said describing the reason behind his move to initiate the new structure. Minister said that he had discussions for long hours with the Federation officials and mooted the idea as infusion of fresh talent was felt as a must if football standards were to improve. “There are 314 Divisional Secretariats in Sri Lanka and we decided to have a football tournament in each of these divisions. We made it compulsory for each of the 314 divisional tournaments to have at least ten teams in their tournament” Minister said. Before the latest move, there were 46 leagues attached to the Football Federation around the country. “We managed to complete these tournaments successfully and actually had more than 2000 teams playing in all tournaments. That was a fantastic response. When I initially suggested this, the Federation officials said straight away that it cannot be done. But I told them that we must try first” explained the Minister. Sports Ministry provided the funds necessary for the tournaments to the respective Provincial Council Directors. But one of the biggest problems faced by the divisional teams was that they did not have boots. “We asked them to play barefoot. We just wanted to popularize the game” said the Minister. The overwhelming success of the tournament was an eye-opener for all. The total number of teams which played the divisional tournaments was 2496, and it was obviously the biggest number of clubs in a Sri Lankan tournament. Heartening, the Minister noted that there were 369 teams from the Eastern Province and 337 teams from the Northern Province where no players came into the national level for the past 30 years. “All these years we were getting players from only two thirds of the country. Football is extremely popular among the Muslim population and the response we got from the East was no surprise. We have now got the talent from the entire island for the first time after ages. This augurs well for the future of the game” observed the Minister. “We sent talent scouts and experts from the federation to watch all 314 secretarial division tournaments and they selected a team of best players from each division. This meant that we harnessed 314 teams” said the Minister. The Sports Ministry then conducted a tournament among these selected Divisional teams in each district of the country from which the best players were picked for a team in each District by the Federation’s experts. These chosen District teams will now play the all-island tournament and depending on the performance in this tournament, selectors will pick a final squad of 30 players who will make the National pool. All the players in these tournaments would be under 21 players. “We are making a huge investment. So, we don’t want to spend such a lot of money and see it collapse within a few years. That is why we picked under 21 players. They will continue to play for several more years and will make classy players with the experience they gain over the years” explained the Minister. All the current club and even national players would be asked to play from the bottom at the Divisional secretariat tournament again and get themselves graduated through the entire selection process. Good national level players who are over the age of 21, will later be absorbed into the national pool. This tournament covering the entire island would be conducted annually and the national pool will be constantly refreshed, according to the plan. “This as you can see is a thorough process of filtering which is completely transparent and I don’t need to explain that the success would be guaranteed when we pick 30 players out of about 30,000 players taking part in the initial stages of the divisional tournament” Minister said. So far the national pool had been in operation for a short period of time only when there were engagements for the national team. Players were doing other jobs and were only part time players. Minister has made arrangements to change this and turn the entire national pool into full-time professional players whose only job would be to play football. The pool players would be given a hostel, food, vitamins and other nourishments and all the facilities required for their training including medical acre and medicine. “All the players would be paid a monthly salary of Rs. 30,000 and the Ministry will find them jobs additionally” said the Minister who has planned out a Rs. 40,000 monthly income package for the players. Minister also revealed that the Ministry is in negotiations to employ a full time coach either from Brazil or Japan at a salary of around $ 5000 (Rs. 650,000). Players would also be provided regular full time training at the National Sports School in subjects such as English, Information Technology, Public Relations in addition to opportunities to exposure in international tournaments. Minister Aluthgamage has also organised an international tournament for this purpose. The tournament which is named the Mahinda Rajapaksa International tournament will be held from December 3 to 10 this year in Colombo among South Asian nations Maldives, Pakistan and Bangladesh and Sri Lanka. He said that the tournament will be an annual fixture hosted on a rotation basis. Minister also revealed that a domestic football tournament on lines of Sri Lanka Premier League (SLPL) in cricket would be held as a provincial tournament. “Each team will be sold to a franchise and each franchise will be allowed to field two foreign players in their team” Minister said. Minister predicted that he would bring back the past glory to Sri Lankan football and make it shine internationally. “This is a huge investment we are making. It might take a few years to show results. But it definitely will” said the Minister.